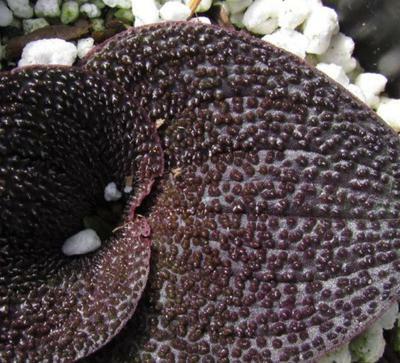 The leaves on a massonia plant are usually full of small green or purple swellings that help it do something. is there a use for it; it seems like an important adaptation? So I did some research. There are a lot of different species in the genus, which is currently in flux. Some genera are mixed up by having many individual plants that don't really fit in any one of the species, showing more or less of a particular characteristic. Massonia pustulata is the one I think you're referring to - this plant has bumps or pustules (sounds horrible, but it's actually quite textural and interesting) which as far as I can find don't have any particular function except as water storage for the plant, which is so incredibly drought hardy that it will come out of its dry dormancy without moisture. Most plants wait until they get nudged into growth by intense rainfall.